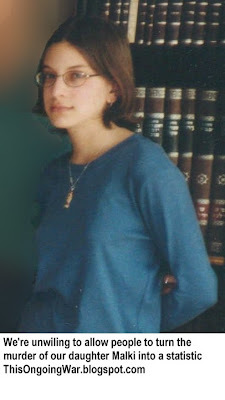 Malki Roth was killed just over 10 years ago in the suicide bombing at Sbarro restaurant in the center of Jerusalem, along with 14 others. Frimet and Arnold Roth kept their distance from the radio and television on Tuesday. They were afraid that the flood of broadcasts would reveal the voice and face, flush with victory, of Ahlam Tamimi in their own home. To see or hear Tamimi, who took part in the murder of their daughter Malki, would be unbearable. So the news slowly filtered into their home in Jerusalem's Ramot neighborhood via frequent phone calls from friends and relatives and a careful use of the Internet, mostly in English. "He's in Israeli hands, there are pictures," the father's matter-of-fact voice could be heard from the other room, referring to Gilad Shalit. The mother was explaining to us why the deal to free the abducted soldier was a "colossal failure," the abrogation of the state's role to protect its citizens. 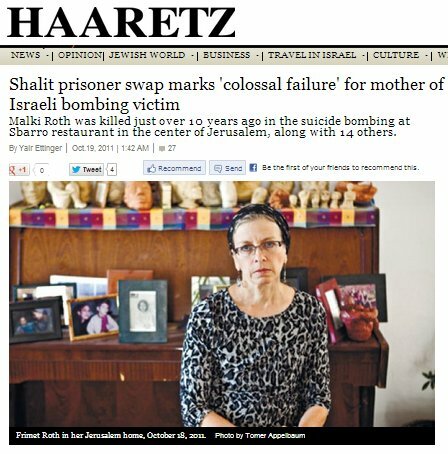 "I'm happy to hear that Gilad Shalit is alive and well," said Frimet Roth. "That's a great relief and happy news. But it's accompanied by other feelings, the difficult ones. There is sorrow, anger; we're having a hard time understanding and digesting it. There is also fear. I'm very scared." She said she was happy that Noam and Aviva Shalit got their son back; she knew what it was to love a child who wasn't there. Despite her tone, Roth said her objection to the exchange, including the release of many terrorists, was based on reason and not emotion. Malki was the fourth of the Roths' seven children. She was killed just over 10 years ago in the suicide bombing at the Sbarro restaurant in the center of Jerusalem, along with 14 others. 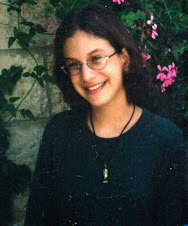 If she had lived, Malki Roth would be exactly the same age as Gilad Shalit, 25. On the dining room table is a framed photo - Malki is seen with her good friend Michal Raziel. The two died together in the restaurant and were buried next to each other. The Shalit deal forced hundreds of families who lost loved ones into an emotional whirlpool that is hard to comprehend. Pictures were pulled out of photo albums, siblings and parents remembered the victims and together watched the news, holding on to each other as if going through another Memorial Day. Arnold and Frimet Roth decided not to gather their children together at home and did not renew their old connections with the other families of the Sbarro victims. They just made sure to keep away from the television. "During the week, the television was on. That's how we discovered that Tamimi was being released," Frimet said. "This morning I couldn't watch the prisoners smiling. It was a nightmare that I dreamed of so many times for so long. I don't want to see her making a victory sign with her fingers." Since the bombing a decade ago, Roth swims every morning in the local pool, something that strengthens her greatly, she said. Yesterday morning she needed strength just to leave the house. But at the pool's locker room she couldn't avoid the topic of the day. Some women said the deal was the "least worst" option, but it was clear they thought the exchange was justified, Roth said. She said she needed to control herself and keep quiet to avoid starting an argument. If she hadn't kept silent, she would have told the women that they, like many others in Israel, were hiding behind a smokescreen. "Only now there are military leaders who are telling the truth that there were military options that were not taken," she said. "Why was it not done? There was a colossal failure here." Roth has written a number of opinion articles in the past few days, including one in Haaretz. The pieces drew many responses but did not halt the prisoner exchange. Roth and her family did not join the petitions to the High Court of Justice against the swap, whose ruling she said was clear in advance. From Haaretz/English (International Herald Tribune) edition. The Hebrew version is here.